The Council decided to postpone the Library expansion decision pending further data and discussion. Council member Laurin Easthom pointed out on Monday, once again, “We need to make some real serious decisions about citizens who use our library and don’t pay.” Laurin has been on-top of this issue for some time. She has also been quite clear in her concerns (THE LIBRARY AND THE FREE LUNCH) unlike several of her colleagues. Her colleague Penny Rich added “Citizens in Chapel Hill are quite generous, but I think the endless supply of money in our wallets is not there anymore.” (Daily Tar Heel, Jan. 26th, 2010). New member Gene Pease, who has been a stalwart supporter of the library for many years – raising significant funds as a member and leader of the Friends of the Library president of the Chapel Hill Public Library Foundation [thanks Fred!] to support its mission – said “To have no conversation about this and about how to attack this problem in the operating budget, I think it’s irresponsible to make the decision tonight” (Lauren Hills,NBC17) in justifying the delay. I’ve watched this issue unfold for several years, called on former Council’s to show some fiscal restraint over the last 4 years so we could accommodate this project. It is clear that given the current economy, a prudent assessment of our Town’s revenue stream, the core fiscal liabilities and obligations we must discharge (which does not include that Lot #5 money pit), the Library expansion must wait. Of course, that’s my considered opinion which is based on the data at hand, my entrepreneurial experience and a financial philosophy that emphasizes “living within our means”. Laurin Easthom foresaw these same issues and tried to set several plans in motion to address this unfortunate juncture – the public’s growing desire for a new facility coupled with a bare public cupboard. Last April, in fact, she directed the Town Manager and staff to come up “with a financial cost sharing plan” to help ameliorate the anticipated rise in operational costs. To date, no plan has emerged from Town Manager Roger Stancil and crew. A quasi-plan did emerge on Monday from new Mayor Mark Kleinschmidt and Jim Ward – pressure the Orange County Board of Commissioners and, as Jim put it, make adequate library funding a “litmus test the winners are going to pass, period.” in this year’s county-level election cycle. Given the County budget mess, the incredible pressure to fund the schools, existing debt obligations, new costs and lost revenues, threats are a non-starter. And, as Jim and Mark seemed to have forgotten, when the county commissioners (BOCC) pushed through election districts, Chapel Hill citizen’s leverage was somewhat diluted. Our leadership must work with the BOCC on adequately funding the library using a more positive approach. Sure, we shouldn’t continue to accept “nice words that … are worth zero” as Jim Ward said of the Commissioners (Greg Childress, Herald-Sun, 01/26/10) but we also can’t expect to get blood from a turnip. The best approach, I believe, is to jointly identify sources of funds, possible cost savings made possible by collaborating on other issues, to find the money we need for operating the facility. That said, “absorbing” additional debt alone should push the start date of the expansion off until next year. The Town Manager is recommending that as the Town retires existing debt we take on new debt by issuing the Library bonds. That might be a sensible approach if our Town wasn’t already burdened by an incredible debt load – historically unprecedented – during such a troubled economic time. The Town needs to retire existing debt, bring our reserves back up and take a small breather before launching into another spending spree. Trash Talk: Plan B and Option D? September 1st, the Orange County Board of Commissioners will once again review the progress of siting a new trash transfer site within the county (agenda here [PDF]). The good news is that the “Plan B” option I pushed for in 2008 (here and here), utilizing Durham’s transfer site until Orange County sorts the site selection mess out, is firmly established on the agenda. The bad news is that the Millhouse/Rogers Road community is under new assualt from “Option D” (here). “Option D”, like Mayor Foy’s poorly considered suggestion to use property adjacent to the Town Operation Center on Millhouse, suggests using county land north of the old landfill on Millhouse. Where and when was this option introduced? I’ve asked BoCC Mike Nelson to clarify the genesis and integration of this new last minute twist on the troubled trash transfer site debate. After this evening’s solid waste transfer site meeting, I took a second to ask Alice why she said delaying the final site selection would lead to “garbage piling up”. She had made that statement earlier, in an effort to encourage her colleagues to make a decision by mid-November. Orange County’s landfill is slated to close in 2011 (Trash Talk: The Ticking Clock). Our solid waste management folks say it’ll take 18 months to get the new transfer site up and running. The BOCC has to figure out the financial impacts, find the revenue and let the contracts sometime early next year to make that date. But if the County doesn’t make that date, will trash really pile up? No, as Alice should know. Even though the local municipalities supposedly balked at shipping their waste to Durham’s transfer station ($42/ton + fuel), I’m fairly sure that Orange County can negotiate a temporary use of that facility while a new one in Orange County is built. If a delay of a few months buys community consensus and confidence, the temporary financial inconvenience will be well worth it. Trash Talk: Will We Stand United? A Lion used to prowl about a field in which Four Oxen used to dwell. Many a time he tried to attack them; but whenever he came near they turned their tails to one another, so that whichever way he approached them he was met by the horns of one of them. At last, however, they fell a-quarrelling among themselves, and each went off to pasture alone in a separate corner of the field. Then the Lion attacked them one by one and soon made an end of all four. Had an opportunity tonight to listen in on a group of concerned Hillsborough and southwest Orange County citizens discuss the potential siting of the trash transfer facility in their neighborhoods (Eno River Economic Zone – 2 sites and Hwy. 54 corridor – 3 sites). A number of issues were raised at the meeting: apparent bias in site selection, the “surprise” announcement of the sites on Hwy. 54 and the Hillsborough zone, weighting of access to water and sewer hookups sans cost of making those connections, inadequate traffic studies, confusing or misapplied scoring of technical criteria, whether the BOCC would implement the more costly enclosed transfer site design previously proposed for Eubanks or shave some costs by going with an open pavilion, concern that Chapel Hill’s/Carrboro’s increased transportation costs were improperly used to justify removing Durham County’s transfer site from consideration, underestimation of water use (500 gals. a day! ), possible “hidden” reasons for acquiring 82 acres ($7.5 million the current asking price) instead of a smaller tract, if incineration and ultimate in-county disposal got due attention and a slew of others which I’m sure the Rogers Road community are well acquainted with. Nathan Robinson, the environmental engineer I wrote about Sept. 16th, a founding member of Orange County Community Awareness, gave the clearest deconstruction of the current solid waste transfer site selection mess that I’ve seen. Orange County’s consultant, Olver, should review his presentation to improve their own dog-n-pony show. Nathan quickly out-lined the dimensions of the issue, discussing what a solid waste transfer site does, how it is laid out, managed and maintained before launching into an analysis, from his professional viewpoint as an environmental engineer, of the problems associated with the current siting process. Nathan’s concerns mirror a number of mine, especially in terms of the weighting of the selection criteria, the incredibly confusing community criteria feedback procedure, biased scoring of the technical criteria, analysis of environmental consequences and the evaluation of Orange County’s waste creation “center of gravity” (my Mar. 9th, 2007 post on that issue: 2035 Orange County’s Garbage Center of Gravity? ). As folks that have read my ‘blog know (or have heard me whinge on about local issues elsewhere), I promote reality-based decision-making using measurable criteria. Not all issues are amenable to this approach. Sometimes you have to make a subjective call – say as to the weighting of the importance of environmental justice in the current transfer site process. As I noted a couple years ago, the previous decision by Orange County’s Solid Waste Advisory Board to plop this new facility back on Eubanks sorely lacked rigor, objectivity and transparency. I questioned SWAB’s ability to make a sound decision because they didn’t generally use objective, understandable, measurable criteria – technical or otherwise – and what criteria they did use were inequitably evaluated differently depending on context and perceived necessity. Because of that disconnect, I lobbied the Board of Commissioners (BOCC) to create a more thoughtful process grounded by sound engineering principles, guided by community standards. I was encouraged by the process they adopted, but, just as the BOCC themselves admitted on return from their summer break, greatly concerned by Olver’s implementation. The folks of Rogers Road shared my concerns and expressed their uneasiness at the BOCC’s Sept. 16th meeting. Of the concerns expressed and the comments made at the meeting, two need serious highlighting. First is the statements by Hillsborough’s elective folks – like Mayor Stevens and Commissioner Gering – to this community that “they didn’t know” about the process or potential siting of the solid waste facility near Hillsborough. I attended several Assembly of Orange County Governments meetings where these issues got a thorough airing. As a quick Google of minutes of these meetings document, Hillsborough’s reps had to know that these sites were in-play. Second, and really the most encouraging of all the comments, was Nathan’s call to adopt a united and collaborative approach in dealing with these outstanding issues. He said, clearly, that he has come to understand the depth of Rogers Roads concerns, their 36 year struggle to simply have promises made – promises completed. He said, clearly, that equitable environmental justice was a relevant criteria and that this was not a battle between neighbors. When a few comments from the folks assembled veered into the “us versus them” realm, Nathan and some of the other organizers rose to say that their emphasis was on the overall process – their focus to get an reliably objective analysis within the established criteria and remove the confusion around the more subjective components of Olver’s mission. Finally, and the most heartening of all, Nathan said he was meeting with Rogers Road resident (and champion) Rev. Campbell today to see how they could work together. I well remember the landfill expansion fight – which pitted neighbor against neighbor. An attempt to avoid that rancor from the outset gives hope the community won’t fracture. Interestingly, the folks around the county starting to deal with UNC’s new airport authority, already recognize that a united approach is a better approach. My hope? That the BOCC improves the process. That they realize that the solid waste transfer decision is a beginning. And they work knowing how these issues are resolved will set the template for the new landfill selection process. Details from Olver, Orange County’s consultants developing the transfer site plan, on their proposal. Trash Transfer Site: And then there were seven? Additional posts on the issue are available by doing a search on “trash” from the sidebar. Quick reminder about tonight’s Board of Commissioner’s working session on siting the Orange County trash transfer station – 5:30PM at the Southern Human Services Center [MAP] (agenda). I continue to be concerned about the process – including the criteria – but hold out hope that a good result will eventually be crafted. More on tonight’s meeting here (OC), here (DTH), here (HS – registration still required!!!) and here (CHN). Our Orange County Commissioners are getting closer to selecting a site to build a county-wide trash transfer station. Please support the Eubanks-Rogers Road neighborhood in their effort to remove Eubanks Road as a potential site for this new facility. Eleven potential sites have been identified. Most of the other sites are west of White Cross Road along Highway 54 or off of the I-40 and Old 86 intersection. This attachment shows all of the potential sites [SEE GRAPHIC]. Every current and future garbage truck in the county will travel the selected route to the waste transfer station. From there all the trash will be dumped and loaded onto extended semi-tractor trailers for shipment out of the county. Please show your support by attending the Orange County Commissioners’ Work Session on Tuesday, September 16th at 5:30 p.m at the Southern Human Services Center on Homestead Road (back behind the new Senior Center.) Please come, even if you will arrive late. – and most importantly, the fact that the Eubanks-Rogers Road neighborhood has hosted our county’s trash facilities for the past 35 years! If there is simply no way that you can attend the meeting on Tuesday, September 16th, please send an email to our county clerk at dbaker@co.orange.nc.us and ask her to forward your comments to each of the County Commissioners, and to include your comments in the public record. Many of your neighbors in the Eubanks-Rogers Road have been working very hard to prevent our area from becoming the permanent trash center for the county. Please give them your support at this critical time in the decision making process. For more info about the issue, google Orange County, NC Waste Transfer Station. I have carved out more time for civic activities of late. As part of that, I’ve thought about applying for Chapel Hill’s open position on Orange County’s Solid Waste Advisory Board. A recent shift in that Board’s leadership holds out some hope for not only a reasonable outcome on the trash transfer site but a new look at managing our county’s future waste stream in an ecological and economically sustainable fashion. To flesh out my earlier post “Trash Talk: Waste Not Methane, Want Not Energy” here’s a few comments from the April 6th, 2006 Orange County Solid Waste Advisory Board (SWAB). There’s a few inline comments demarcated by [CitizenWill:…]. Tipton [BJ Tipton – member ] states that other than what was in the newspaper I don’t know a lot about what is going on. I just wanted to get the update. Wilson [Gayle Wilson – OC staff] states that a presentation was given at the Assembly of Government’s meeting March 30 regarding this. Back in 1997-98 an EPA representative, myself and another staff member met with UNC Energy Services officials who were in the process of designing a fourth boiler (at UNC) and that was when they decided to look at modifying the boiler to use landfill gas. The University never formally responded. Over the years the use of landfill gas at Chapel Hill North has come up. Phil Barner of UNC facility services called at the end of October early November and stated as they were talking about Carolina North they wanted to know about using landfill gas. I explained that we had a consultant do a report and would be glad to send it to him. After the report was sent in February, I didn’t hear anymore about it until a couple of weeks ago. Then we got a letter from Carolyn Efland at UNC about landfill gas. Now there appears to be competing interest in landfill gas. Some of the Commissioners are interested, if it’s feasible, in powering the new Animal Shelter, a new elementary school to be developed on Eubanks Road, our Operations Center and possibly the transfer station. The University has some interest as well. We are in the process of discussing further work with our consultants to do an additional evaluation regarding each of those potential uses. We know that we have gas, but if Carolina North isn’t coming on line for another six or seven years it won’t be worth it. There are no partners imminent, like next June. Sassaman [Jan Sassaman – member] states that the gas would have to be used, you can’t store it. Smith [Remus Smith – member] asks if the landfill was closed tomorrow how many years would it take to produce gas? Wilson states that gas worthy of recovery – 12-15 years of time left. Tipton states that the report talks about the flow. Wilson states that there are two landfills. The old one on the north is down the [gas production; it started in 1972] curve. The one on the south side isn’t half way up the curve. It has some good stuff coming from it now, but it will not produce for a long period of time [because it’s small]. Kabrick [Randy Kabrick – member] asks if it is being flared now? Wilson states that we are passively venting it. We have one flare at a central point. I have been resistant in the past because I didn’t want to scare the neighbors lighting up the landfill like a birthday cake. Now we are going to take another look at it even though we are below the regulatory threshold for recovering it. Kabrick estimates 500,000 cubic feet a day are vented. Wilson notes that the biggest single cost of recovery is the network of piping that must be installed and for an active landfill it’s more difficult until it’s closed. Spire [Paul Spire – staff] notes that there is no infrastructure for recovery on the south side now at all and there are problems with putting this gas into the pipeline; the gas company doesn’t want it. Wilson notes that [unlike Duke Power] the gas company is not required to accept landfill gas. Tipton asks when will this group take any action on this? Wilson states that I plan to keep you all apprised of any reports. If you all have any input it would not be out of line to make a recommendation. You will be hearing more about it in the next six months. As I noted above, we are currently venting from the smaller, older (1972) landfill enough gas to drive a 1 megawatt electric power plant. 1 megawatt of discarded capacity seems like a profligate waste to me. Imagine what we could do with the “newer” landfill. Imagine if we used fuel cells with land fill gas [PDF] instead of internal combustion (more expensive upfront but the lack of nasty byproducts make it worth considering). Imagine if we positioned our county to be more self-sufficient, reduce dependence on Duke Power’s coal-fired misery and generate some positive cash flow to boot! Is that the Orange County we live in? 2035 Orange County’s Garbage Center of Gravity? 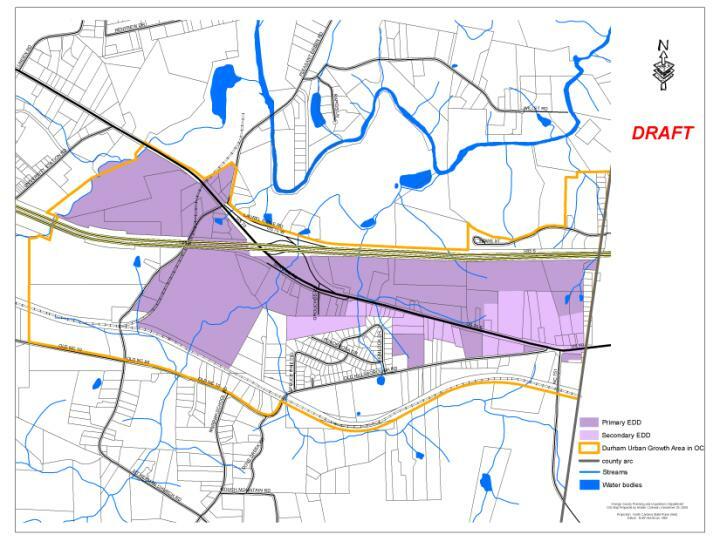 I was struck by a conjunction between the following image from the Durham-Chapel Hill-Carrboro Metropolitan Planning Organization 2035 Long Range Transportation Plan Socio-Economic projections I mentioned earlier and the debate currently raging over siting a trash transfer station on Eubanks Road. 35 years ago the Orange County landfill currently blighting the Rogers Road community was sited close to Chapel Hill/Carrboro communities because they constituted the predominant source of garbage. Now, with projections of dramatic population shifts 30 years hence, it seems like the center of gravity for Orange County’s trash production (creation?) is shifting North. I did a quick review of the Orange County Board of Commissioners agenda items covering the Rogers Road issue and couldn’t find a discussion of a new “trash axis”. Maybe those more mathematically inclined could weigh in on how to calculate this new centroid which, it would seem, help locate the most effective transfer site. This time last year I was catching 14 winks in preparation for election day. Earlier in the evening I had made the rounds collecting my outlying signs for redeployment. About 3 hours from now, I was leaping out of bed to fill some balloons, say a hasty goodbye to the family and rush to pick up local activist Tom Jensen ( thanks again Tom for kindly assisting with the last round of sign deployments at every municipal polling station). It was the start of one of the longest days in my life. Exhilerating, enjoyable, extraordinary, engaging – the hospitality and good cheer of the citizens of Chapel Hill made the long hours fly by. The beautiful fall weather was an incredible bonus. I’m quite interested in the fortunes of our southern neighbors in Chatham County. As reported in today’s N&O, local Chatham activist Mark Barroso has put together a great little youTube video on the outgoing Commissioner’s ill-deeds. 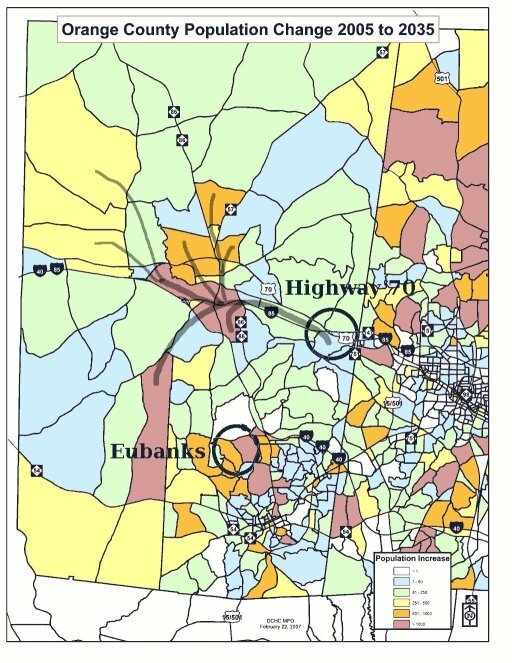 By the way, the Chatham redistricting proposal, which everyone should vote NO on, serves well as an example of the divisive nature of districting. Orange County residents should vote NO on our referendum to preclude such inanity. Via Dan Coleman on OrangePolitics. There were 20+ folks tonight – with a couple from the media – maybe 4 or 5 organizers – some town staff and the balance being interested citizens. I was already convinced that District 15B voters have a heck of slate of candidates before them – tonight I was more impressed than ever. Very simply – we can’t lose. Of course, we have to pick and the candidates did a good job differentiating their philosophies, approaches, procedures and performance. Due to what turned out to be poor placement of the camera and some technical issues I botched Adam Steins opening statement. In my defense, I set my camera up early – on a tripod as per BrianR’s excellent recommendation – well away from onlookers and the moderator. But then “dancin’ Doyle” decide to move stage right. By that point, my bobbing photographic nemesis for the night had taken the high ground. Opening statements in reverse order appearance on the ballot. Essentially, Adam Stein reviewed his service before the bar, his work on the Mel Watt and Daryl Hunt cases and laid out his career as per the first forum. I apologize for cutting Judge Fox off during question on political parties influence: essentially he gave a reprise of his answer on parties and politics from the 1st forum. Stein’s pre-determined short term on the Superior Court bench. Staying current with the law. Anderson on reforming the system for selecting judges – especially the perception of the public about what the effect of money has on jurisprudence. Anderson on keeping current with the law. Stein taking up the transition challenge with his closing statement. Stein on why he’s punctual now – great story of his youth. Fox on managing high profile cases. Baddour on how a short term can hurt our system of justice. Baddour on direct outreach and keeping the “common Joe” in the picture. Again, I apologize to the candidates for weaving around, botching the focus, not anticipating “dancing Doyle” and, in Mr. Stein’s case, completely zapping a segment. I’m working to get better at this vLog business. And to my readership, thanks for the feedback. I wasn’t sure if these videos would have any utility. Opening statements. I botched Mr. Stein’s statement. Later this week I hope to retrieve a video copy from the cable telecast. youTube link to opening statements. Madison: Some Smoozing, No Snoozing. At least, not much snoozing as participants have reported on local ‘blog OrangePolitics.org. I appreciate the time and effort Mark Chilton, Gene Pease, Fred Black and Dan Coleman put into real-time reviews. I hope some of our other “known” blog commenters (Anita, Linda, Aaron, Andrea, Diane ?) get in to the act. [UPDATE:] Anita and Frances Henderson joined in.